Announcing Keep It Thimble’s first giveaway! 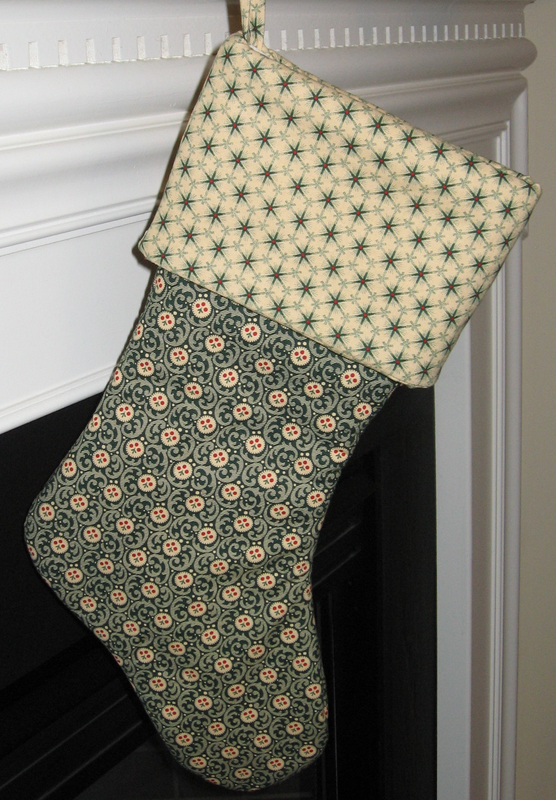 Put your name in the hat for a chance to win this Christmas stocking I made from Civil War reproduction fabrics. The pattern is free from the McCall’s website. You will need to enter your email in order to get it – and so far I haven’t been spammed by them. To enter, just leave a comment on this post. Be sure to provide a valid email address. The winner will be chosen at random on December 18th. You will be contacted for your mailing address if you are the winner! This entry was posted in Giveaways, Holidays, Sewing. Bookmark the permalink. I’m so glad you visited my blog and loved the spool design. It is a good one for sure epecially on the right top! I’d love a chance to win your adorable stocking. Thanks for sharing the free pattern site too! Thanks Mary! They have some fun patterns on that website. I plan to add a page where I just have links to some fun free patterns. Thank you Schweitzers! Hope you had a great Thanksgiving. I can’t believe that you are giving this away! It looks fabulous! What a sweet giveaway! Your Christmas stocking is very cute! I love the fabrics you chose! Please add my name to your hat for the giveaway. I am going to go take a look at the McCall’s website. Thanks for sharing! Do the fabrics look familiar to you – I got them at Plain and Simple. My plan is to make 4 stockings from that fabric line, maybe for next year! Thanks for the heads up on the free pattern. I’m headed over there next. Please include my name in your drawing. Thanks Renee! Have fun sewing! You’re so nice Stephanie! We need to get back on track with our sewing club projects. Maybe this spring? Such craftsmanship! I hope I win!!! Thank you Collier! I’m glad you like it – I think this would look great in your house. Thanks for visiting my blog Suzanne! I love the stocking. Please enter me in the drawing. I don’t know how you manage to make so many cute things. Thanks Mom! You are now officially entered :). Wow that is amazing, I love the fabrics your picked out for it. Off to get the pattern. Thanks Laura! I am glad you like the pattern. You do such beautiful work; truly impressive!!!!!!! Thanks for the kind words Barbara. Now I have it in writing ;). Hi, I love the stocking and the fabrics you chose. I’m glad you like it Corrine! I was thinking you could embroider someone’s name on the cuff or add some applique.